DHAKA, Bangladesh, May 15, 2013 (ENS) – A cyclone blowing across the Indian Ocean is expected to hit Bangladesh on Thursay, threatening the lives of 8.2 million people in northeast India, Bangladesh and Myanmar (Burma). The highest storm surge and rainfall predictions are for Bangladesh’s coastal cities of Chittagong and Cox’s Bazaar. Tropical Cyclone Mahasen weakened Tuesday and was downgraded to a Category 1 storm with winds of 74-95 mph, but a red Storm Alert remains in effect. Cyclone Mahasen is seen as a white shape moving along India’s west coast in this image from the Bangladesh Meteorological Dept. The U.S. National Aeronautics and Space Agency, NASA, now reports the storm has been strengthening and expanding as it moves through the northern Bay of Bengal. 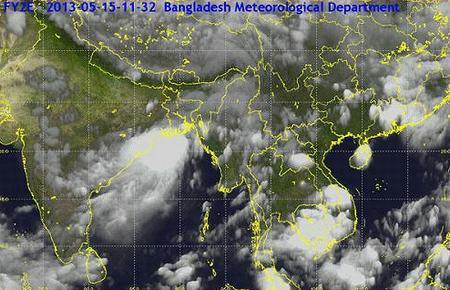 The western edge of the storm is now skirting the coast of central India on its way to Bangladesh. Hundreds of thousands of people in Bangladesh and Myanmar were forced to evacuate over the past 48 hours as the cyclone approaches low-lying coastal areas hosting refugee camps for survivors of Buddhist-Muslim clashes in the region last year. “Although Mahasen is not a strong cyclone, it is large and will generate a storm surge over a large area along the coastline. The storm surge poses the greatest danger to residents of Bangladesh,” said NASA in a statement today. In Bangladesh, preparedness meetings have been held in Dhaka and all of the 14 District Committees. District Committees have been advised to treat all public buildings as cyclone shelters, including private buildings such as hotels. 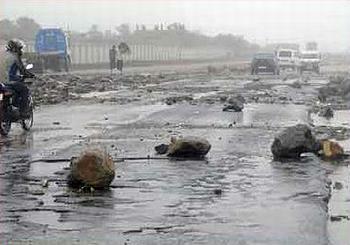 The government says private property owners will be compensated if necessary. The government has allocated rice and cash payments to each district. Some 40 water treatment plants are ready to be mobilized to the affected areas. The Armed Forces, under the Prime Minister’s Office have established a coordination and information group in preparation for the storm, and the Air Force is on call, ready for food distribution drops. While the government has not requested assistance from the international community, of particular concern are the hard-to-reach areas, especially island communities. Abdul Wazed, director general of the Department of Disaster Management, briefed humanitarian agencies and told them refugees from Myanmar around Cox’s Bazaar are located on higher ground, and are therefore less at risk than people in lower-lying areas. Wazed confirmed that assistance would be provided equally without discrimination, according to the UN High Commission for Refugees, UNHCR. A new telephone hotline in Bangladesh that gives advance warning of severe weather will allow Bangladeshis to get recorded weather bulletins and flood forecasts 24 hours a day from the Bangladesh Meteorological Department by dialing 10941 on their mobile phones. Humanitarian agencies in Bangladesh updated the government on their preparedness plans, and clusters have been working with the government to ensure complementary efforts. All clusters are reviewing and/or revising their contingency plans with input from all cluster members, updating stocks and pre-positioning supplies in at-risk locations such as Chittagong. In Myanmar, relocation and evacuation efforts for at least 38,000 internally displaced people are underway according to the government’s plan, says UNHCR, although some people are reluctant to move. The Myanmar government agrees that relocations are to be done in consultation with the IDPs, and Muslim leaders have issued a statement encouraging people to cooperate with authorities. Humanitarian agencies tell the UNHCR that they need to understand what the triggers are for starting Stage-2 of the evacuation plan which involves moving 100,000 of those internally displaced people. On May 13, seven boats with IDPs from the Pauktaw camp Nget Chaung were moving to other camps in advance of the storm when one of the boats struck rocks and capsized. Fifty-eight people are missing, the government confirms. The UN is calling for search and rescue capabilities to be assessed. In Myanmar’s northern Rakhine State 64 villages are to be relocated. Evacuations began Monday and should be completed today. Humanitarian agencies responding as clusters in the areas of health, protection, shelter, food security, education and, water and sanitation have all made available staff that can deploy for response and assessments. Medical supplies, tents and food and been prepositioned in advance of the storm. Planning Minister Dr. Kan Zaw has told humanitarian agencies that the government will not allow anyone to die in the cyclone, and that assistance must be provided equally to all affected people.